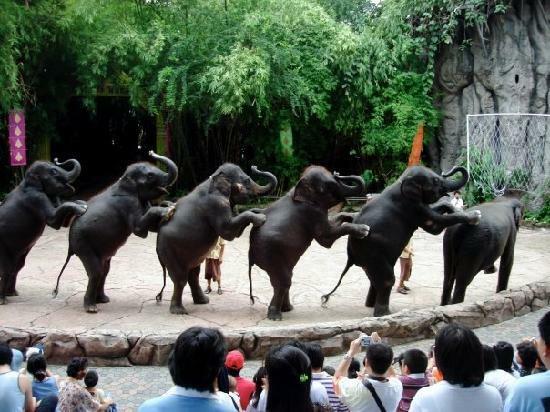 Bangkok Safari World is the greatest entertainment package you can get in Thailand especially for kids. The Safari World covering a huge area of 300 acres is no doubt the best open zoo I have ever visited. It was my daughter’s idea but my husband was not happy as we required the whole day to enjoy the place and avail all the offered activities. As we entered the main gate, we knew it was worth it! And my Husband ended up having an amazingly crazy time. 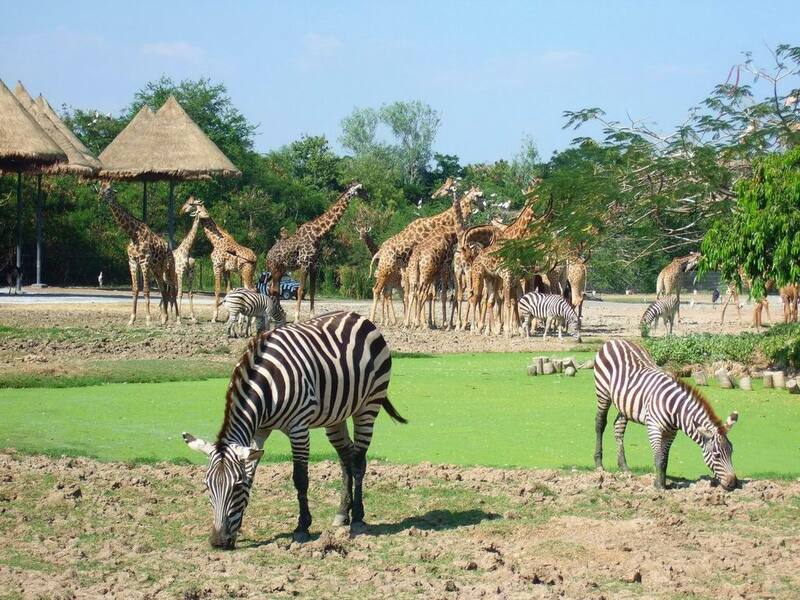 The Safari World is divided into main four sections, which separates the safari park from the Bird Park and Macaw Island from the amazing Games and activity Corner. I enjoyed the thrilling safari drive the most. Going slowly on the pace we wish and clicking the wildness around us was incredible. I actually don’t like the idea of putting animals in a cage and display them as a showpiece. For this reason I always hated zoos but I realize the importance of these safari parks and Zoo’s when my children are in a learning age. These places are highly educational and an open zoo is the best idea with no cages furthermore a liberated, safe and close to nature habitat for the animals. Safari World Bangkok is not just safe for the animals but is secure for you as well. You just need to follow the security’s order of not stepping out of the car. Go around in your own car and enjoy the beauty and wildlife of Asia and Africa. There is a wide range of animals and you will surely experience some safe but close encounters with the wild animals. There is so much to see, so just relax and grab a packet of popcorns and chips and start your safari. You may be lucky and find some animals on your car’s windows, poking their nose and being curious about you. If you need any kind of assistance, there are vans standing by for help.Lions and elephants along with tigers and zebras, roaming around you is a very fascinating feeling. Ostriches running here and there will surely interest you. There is a large variety of deer and the huge rhinoceros are captivating too. Moreover the long necked giraffes can be spotted from a distance but you will need a pair of binoculars for the animals far away and the birds flying up high. You will be provided with a map when you enter the Safari World but you still need to be careful and move your head everywhere to make sure that you are not missing anything interesting around you. The park has so much more to offer other than the adventurous drive through. There is a splendid mix of exciting shows that are offered all day long. The Cowboy Stunt Show is one of them. Watching the cowboys and bandits pushing around and exhibiting the powerful stunts is breathtaking. On the contrary the sweet Bird Show is very lovable. The soothing chirping sound of the birds and their colorful presentation is unforgettable.Other shows, like “The Spy War Show” at the Safari World Bangkok, is a visual treat with special effects and jaw dropping Para-trooping stunts. How can I forget the Sea Lion Show?This show is very cute, with the adoring seals waiting to entertain you. If you reach the park in the morning, you can get a chance to see the incredible Tiger & Lion Feeding Show. This thrilling demonstration will surely leave you stunned and memories of the show will not fade easily. Marine Park is another side of the Safari World where you can find exciting different shows and take a jungle river cruise. Professional water skiing and the incredible dolphin show is another attraction offered at the Marine Park. Friendly dolphins performing tricks with the balls and amusing the guests by making somersaults is a very pleasant experience.When we visited the Safari world Bangkok, the trip was very tiring and by the time we reached the Marine Park, the kids were exhausted too. So we left the other adventures for the next trip and went back to the hotel. I advise you to book your transport and tickets before hand and make a planned time table so that all the offered shows and adventures can be availed with no trouble. Bird Show: Colorful and beautiful flying creatures are ready to take your heart away by their acrobatic skills and demonstration of the athletic amazement. These little birdies will make you enjoy their innocence. The pair of lovebirds will set your mood on the romantic mode for sure. Sea Lion Show: Mischievous Sea Lions will take control of the stage and take you to a journey of the Pacific coast. The turns and twists with upside down chaos created by the Sea Lions is a treat to watch. Orang Utan Boxing Show: Hairy champions are ready for a hilarious boxing show with their calculated tricks and humorous stunts. I am sure you will enjoy the funny ride of this remarkable Boxing Show. Dolphin Show: This show really mesmerized me! 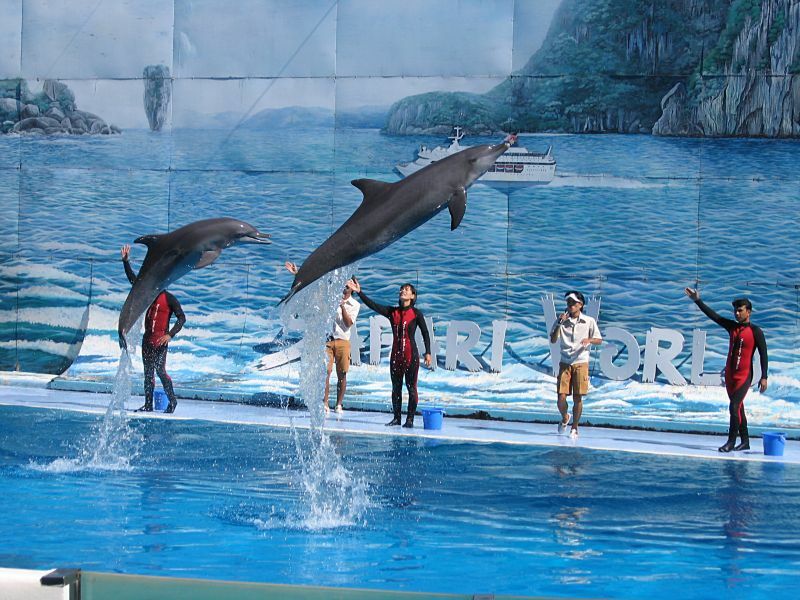 The intelligent Dolphins are very friendly and have mastered even the difficult tricks of the show. Have you ever dreamt of shaking hands with a Dolphin? Or kissing one? This is the time to make your dreams come true. The marvelous Dolphins will not just sing along, dance, play with the ball, and perform some amazing tricks but they will welcome you to shake hands and will give you a gentle kiss too. Experience of touching a live Dolphin gives you Goosebumps certainly!Other shows like Spy War, Feeding Show, Cowboy Stunt Show are also amazing and a must watch. Beside the shows, other activities offered by the park include the “Eggs World” which is a very educational and informative corner for the visitors. Egg incubation process and related details are colorfully and interestingly displayed for the visitors to understand. For theMarine Park, I recommend you not to miss the Jungle Cruise ride as this is another fuming ride with splashing experience of a new phase of adventures. Generally the park gates are open for the visitors from 9 am till 5 pm and the car park facility is also available. Besides the Parking facility, other services offered are:* Souvenir Gift Shop: It offers you animal printed caps, T-shirts, handicrafts, glassware and other interesting gifts which can be a part of your Safari World memories back home. Restaurants: You have plenty of choice and amazing food offerings at the restaurants in The Safari World. If buffet restaurants, fast food stalls, and the restaurants serving traditional food not enough, than you will be glad to know that vans serving snacks, ice creams and beverages are standing throughout the park to serve you. Coach Service: The comfortable Coaches are at your service throughout the day. Make sure the bookings are done beforehand to avoid any problem. Information center: For your assistance and guidance, the information center is always at your service. The trip to the Safari world will definitely turn out to be a memorable and fun filled event. Just follow the safety instructions and DO NOT get out of your car until you are out of the Safari drive through. Wishing you an adventurous trip! Does Safari World offer elephant riding? From where to book coach before visiting safari world?